50 km (31 miles) from Paris, a former 17th century, listed chapel and its turret - monastery for sale France - in Picardy, Nord-pas-de-calais, Lille, Champagne-Ardenne, Lorraine, Alsace and Franche-Comte region - Patrice Besse Castles and Mansions of France is a Paris based real-estate agency specialised in the sale of Religious edifices. 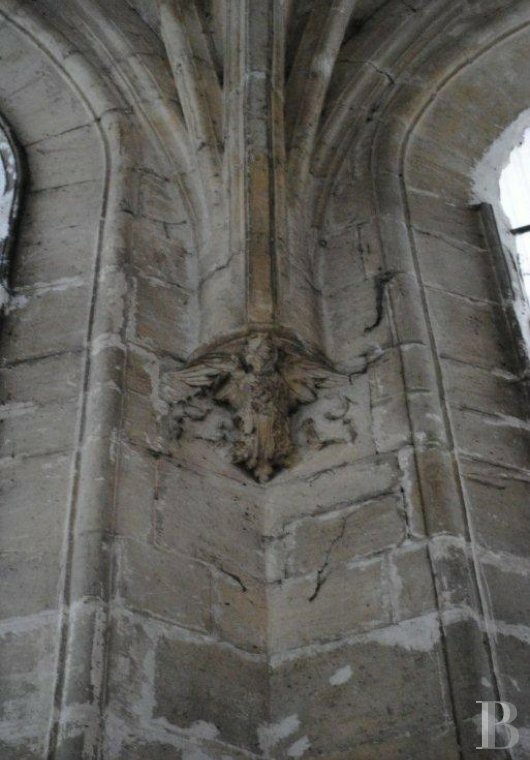 Near to the capital, between the Vexin region and the Norman area of the French department of Oise, in the middle of the Thelle area. Nestled in a valley between Beauvais and Chantilly, famous for their sources and watercress beds. Between outstanding sites and unspoilt areas, between monuments and forests, between barns and rivulets. On the outskirts of a hamlet, just a few minutes from a neighbouring market town. On the borders of the Ile-de-France region, less than 30 minutes from the “Cité des Princes” (Chantilly), and approx. 45 minutes from Paris and Roissy-CDG. This astonishing building is in a clear setting. 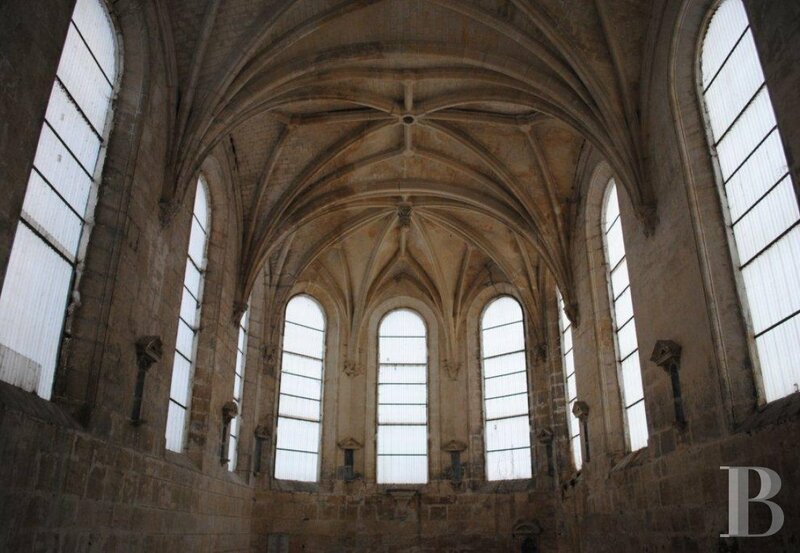 The inside comprises a single nave, composed of three bays. It is illuminated by an oculus situated above the entrance doors, and by ten large windows that were once filled with clear, diamond-shaped pieces of glass, positioned lengthways and bordered by coloured pieces of glass decorating the periphery. To the south of the choir, Epistle side, on the right, a small altar, composed of a recess, crowned with a shell, in a rectangular frame adorned with a rosette in each corner, is sculpted in the stone. In the centre, higher up, is a pedestal with a sculpted base. 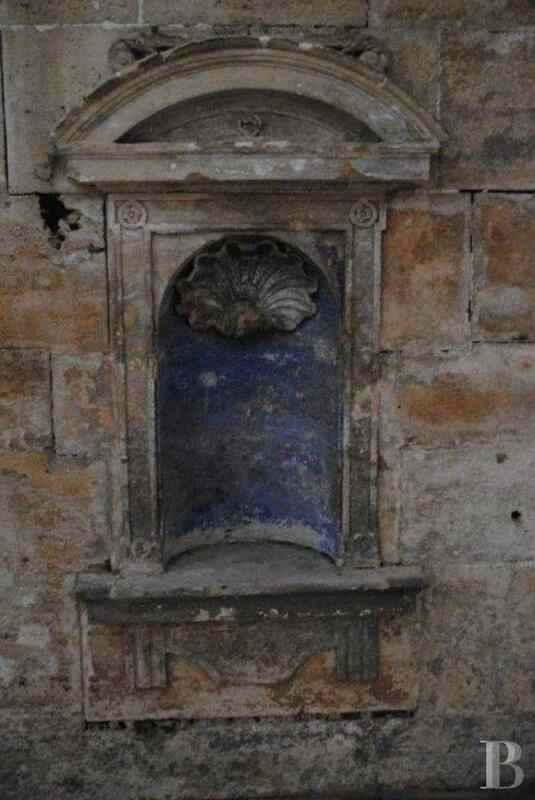 To the left, a heavy marble plaque, illustrated with an engraved text consecrating the blessing of the chapel, is solidly affixed in the stone.All around on the stone walls, below the corbelling, are other recesses with triangular frontons. 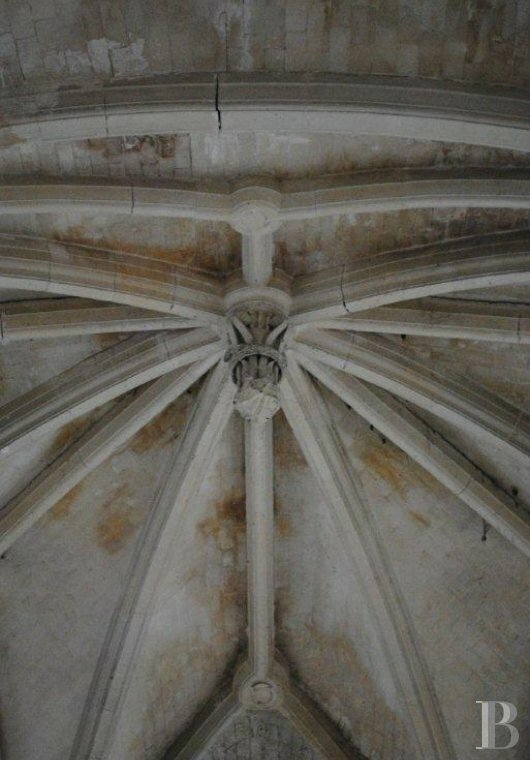 Above, the nave is covered with cross-ribbed vaults, transverse arches, lierne ribs and tiercerons or secondary arched diagonal ribs, which are outstanding in every way. 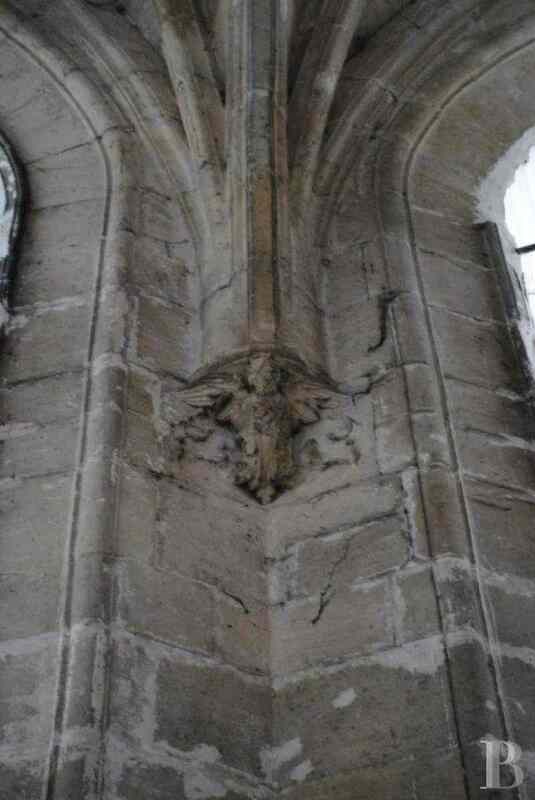 The apse has a radiating vault also with lierne ribs and tiercerons. 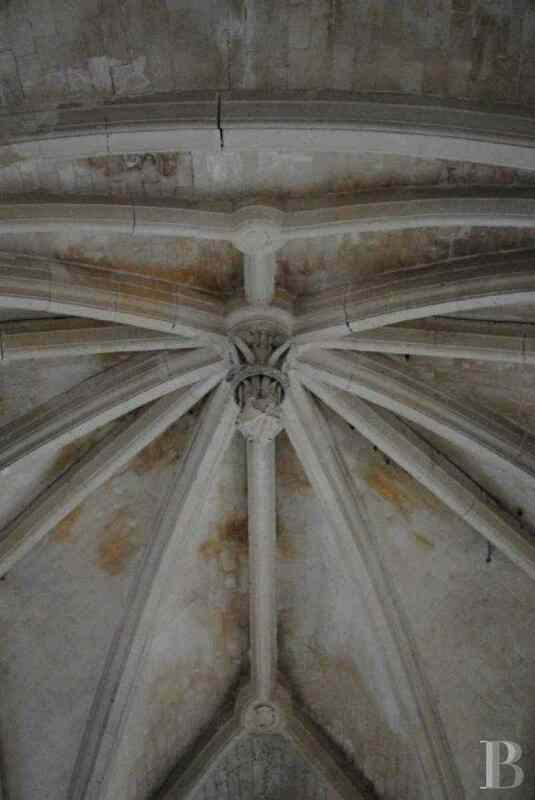 All the vaults rest on corbelling with sculpted decoration. 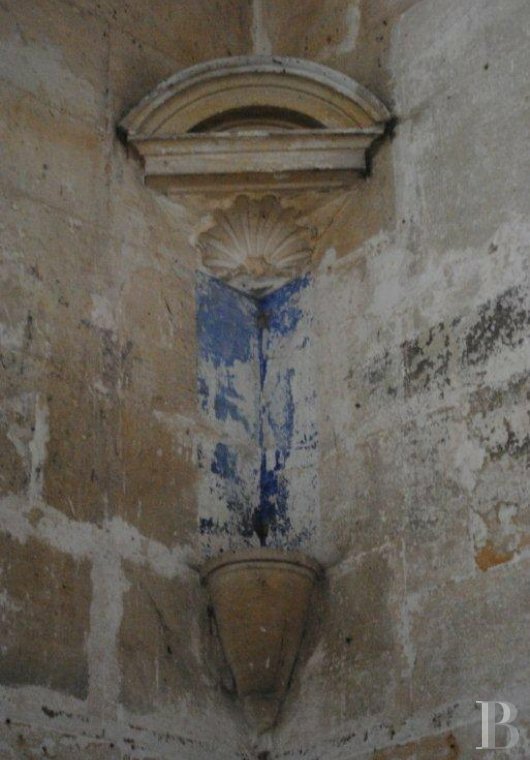 It is worthy of note that the wall arches of the choir’s rectangular bay are only slightly pointed, whereas those of the cut-off corners are actually equilateral. 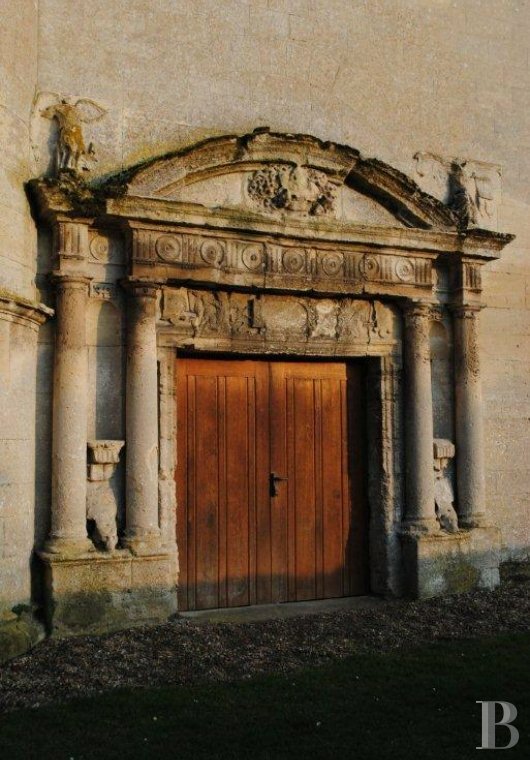 On the west facade, the entrance doors are adorned with a portico, crowned with a rounded pediment, featuring four Doric columns, as well as numerous elements and detail finely sculpted in the stone, amongst which are two original, small mascarons that are partly hidden. 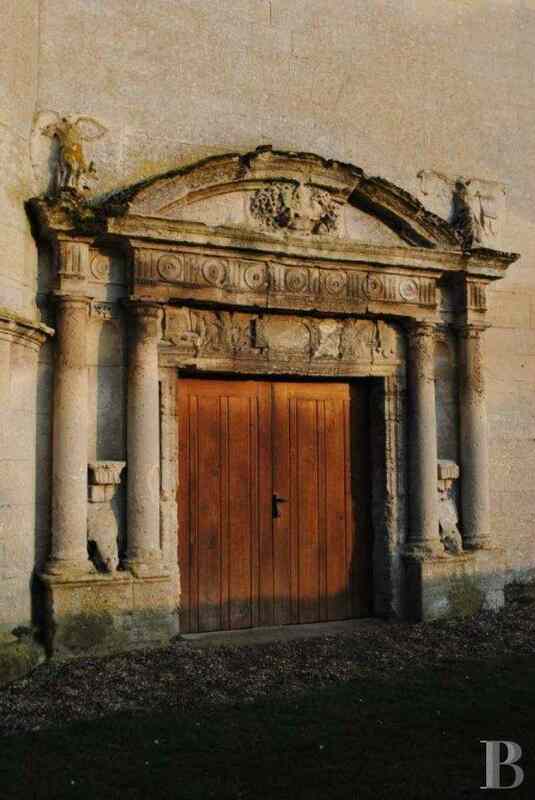 The composition of the portico and the style of the sculptures, like that of the corbelling, brings the second half of the 16th century to mind, and more particularly the less sober style of an architect and sculptor of the time, who played an important role in the Renaissance period. 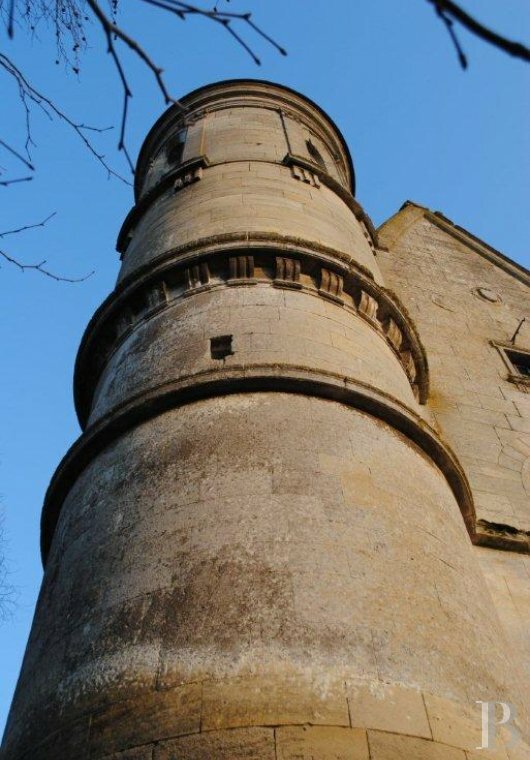 Flanked on the north-west corner, stands an astonishing turret, in which a stone, spiral stairway with a central newel and fifty steps leads up to the attic space, and right at the top, to a small circular room, illuminated by tall atrium windows. The attic space which can be lived in has been converted into one vast room with an astonishing roofing framework.At the end, a wooden structure supports the bell that was added during restoration works. This outstanding cast item, finely sculpted with motifs and a text, is intact. The upstairs is fitted with lighting and electric radiators. The facade wall features a small window. In one corner, there is a toilet with a narrow wooden stairway next to it. Above, on the last floor, is a small converted studio flat, fitted with basic comforts. 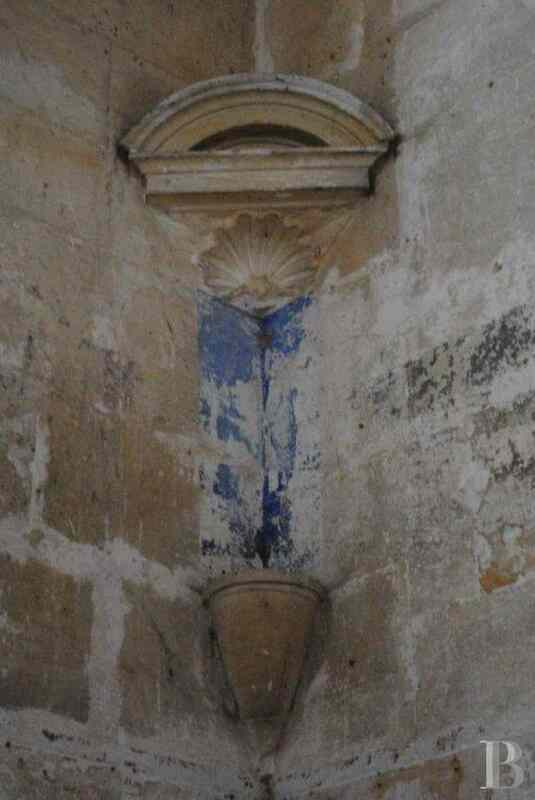 And the original circular room in the turret’s lantern. The edifice is surrounded by lawn. In front are a small square with public wooded gardens and a car park. To one side, a vast area of wooded land is watered by a narrow stream. Around and about are several old small farmhouses, and unspoilt, peaceful countryside. Set on a plot of almost 600 m² (0.15 acres), the building spans a total floor surface area of more than 320 m² (3,444 sq ft). This chapel is by and large of great interest. It is rare as it is the only religious edifice dating from the beginning of the 17th century in the region. It is outstanding because of the perfect unity of its architectural design. A highly original edifice with its turret. An authentic chapel that already has accommodation and comfort as well as huge conversion potential whether for a private or a professional venture. A unique edifice on an unusual site. The proximity of the capital is an asset. This chapel is by and large of great interest. 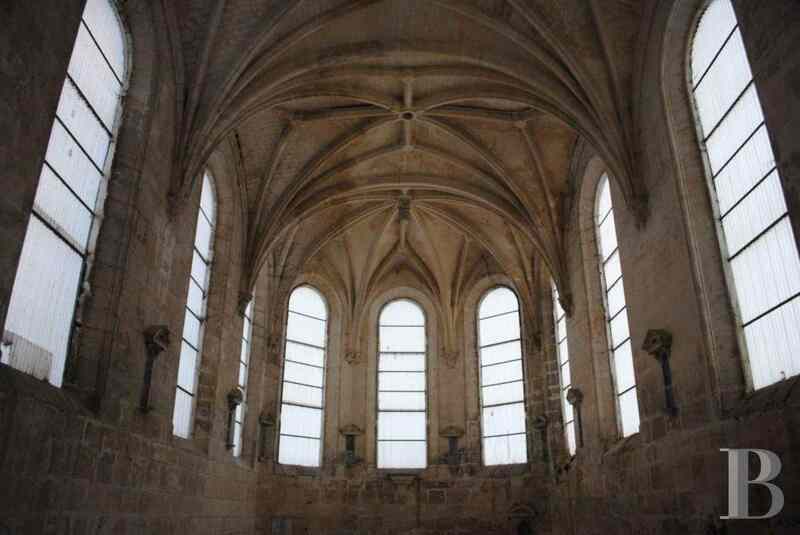 It is rare as it is the only religious edifice dating from the beginning of the 17th century in the region. It is outstanding because of the perfect unity of its architectural design. 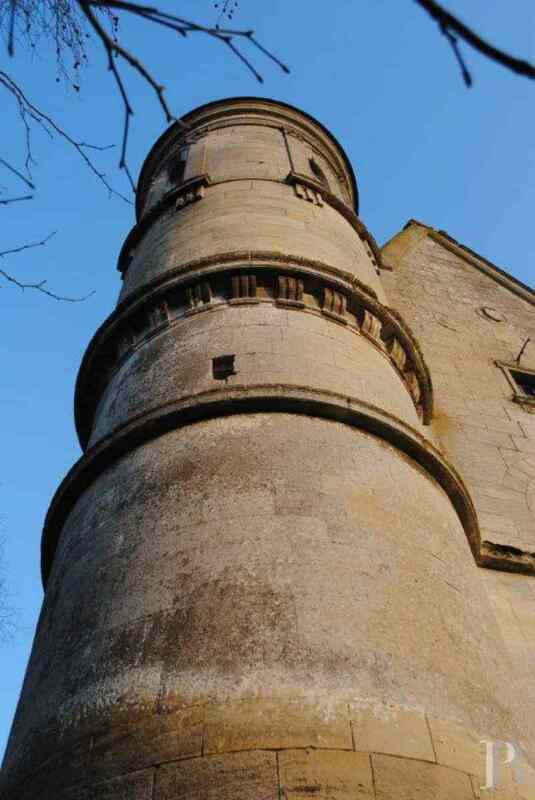 A highly original edifice with its turret. 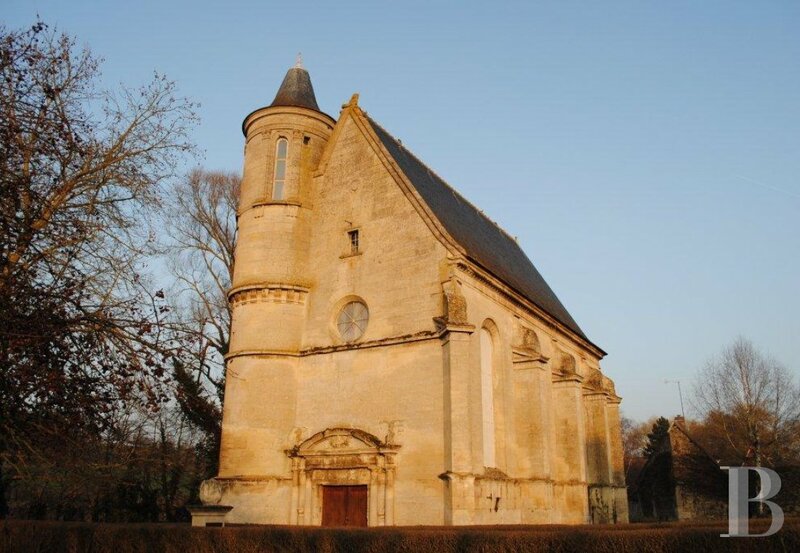 An authentic chapel that already has accommodation and comfort as well as huge conversion potential whether for a private or a professional venture. A unique edifice on an unusual site. The proximity of the capital is an asset.